This is Port McNeill – Business, tourism and adventure happening in Port McNeill, B.C. 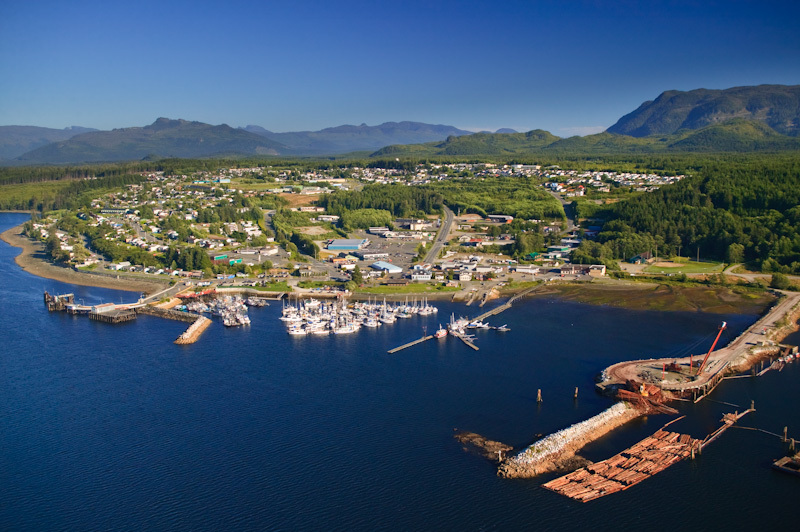 Business, tourism and adventure happening in Port McNeill, B.C. “It’s an eclectic mix of local artists that’s just amazing to behold.” That’s the enthusiastic response I got from shop owner Carol Ellison when I asked her for the store’s elevator speech. Located in the Pioneer Mall since 2014, Carol aka The Bead Lady has been creating for most of her life. And for those who have never visited the store don’t let the bead part of the name fool you. The emphasis is definitely on gallery. Ellison may have started off selling her own beadwork but soon branched out carrying other artist’s work. Fifteen different artists are now exclusive to the store. Over time the store has morphed into carrying a few small antiques and eventually expanded into ladies clothing as well. Wish I could come up with a flashier cliché but you really have to see it to believe it. The gallery includes: ceramic & glass art, mosaics, First Nations carvings and woven hats, teas, soaps & lotions and jewelry. Funding from Community Futures of Mount Waddington has allowed Ellison to buy stock and to expand her line of clothing. Colourful flowing dresses, tops, leggings, wraps and scarves. Stylish and comfortable clothing for every day or a special occasion.Carol keeps a wish list for customers if you’re not sure what to buy your special someone. According to Ellison loyalty is the number one reason customers select her store over others. “We try to make the customer’s visit enjoyable. The whole ambience is to make you feel relaxed and comfortable.” She adds, “just a small thing like the fireplace being turned on makes a difference.” Admitting with a smile that there’s no heat coming from the fireplace — people just want to sit there. Things you may not know about Carol Ellison & The Bead Lady’s Gallery. She donates to local groups…a lot !! Whether it’s a purse or hand crafted jewelry Ellison does what she can to help local groups and their fundraising efforts. And in a previous life she was master florist for 27 years specializing in wedding flowers. Slow down next time you’re walking by the shop. Ellison’s creativity includes the ever changing window display. There’s something fresh and new for each occasion or sometimes display ideas just pop into her head, that she thinks “are funny or would be cool.” Just wait until Christmas !! The store goes all out for Christmas. A few hints – trees, teddies and a train. You’ll just have to wait. Living in a small town means Facebook is quite often my first source of local news. That’s how Kids in Motion hit my radar. The idea was born last year when Lani Siminoff and her partner Matt Martin talked about creating an indoor play space. Port McNeill has its share of inclement weather. Rain. Lots of rain. Lani and Matt took the idea to friends and then the whole community. They formed a non-profit society. Fundraisers included: a ladies movie night at Gate House Theatre, a hot dog sale, petting zoo at Orca Fest and a gofundme campaign. In November 2016 Kids in Motion opened their doors and now six months later they’re planning phase two. Matt Miller, who is also Secretary of the society, kindly answered my questions about how it’s all working out and what’s next. Do you have a strategic plan? What key things are you trying to accomplish? We want to grow the society such that we can offer programs that fill unmet, or undermet, needs in the community. Currently our main goals are to establish two new programs (in addition to our Play Centre) – the Summer Day Camp as well as the Toy Library & Makerspace. Once the new programs are established, we’ll likely need to enter a phase of consolidation. The key objective is to make Port McNeill the undisputed best place on the island to raise a family. The single best way, in our view, of improving the health of society is to invest in the lives of children aged 0-6. The literature and experts agree that early intervention and investment in children sets their health trajectory for the rest of their lives. What are your most urgent needs? Our most urgent need is cash donations. We have been lucky enough to be the successful applicants for a number of grants, however it took leveraging of donations to get those grants. We are still raising funds for our combination Toy Library & Makerspace. What do you wish people knew about Kids in Motion? What would be the greatest difference in helping Kids in Motion get better at what it does? More volunteers who can dedicate energy to helping us develop new programs and consolidate our existing ones. What differentiates Kids in Motion from other kid’s groups? I think we have more of a focus on being an umbrella organization. What other kid’s group do is great, however they seem to exist in silos from each other. The advantage of being an umbrella organization is that it allows us to start building a brand, which helps with people recognizing us. It also allows us to expand the number of grants we can apply to. Goals for the next 5 years? We hope to be a small part of big improvements in health and well being outcomes for children (for example those tracked by the Early Development Instrument). We also hope to be a small part of a big cultural shift in Port McNeill whereby a larger percentage of the population is partaking in healthy activities and getting involved in the community. Is there a board and/or leadership team? Yes, we have a Board of Directors which consists of 6 people… we all work and have young families and do our best to volunteer our energy when we have it. Are you collaborating with other organizations? If so examples. How would you like to enhance these efforts? We’ve received support from other service organizations, numerous businesses and individuals. We have reached out to other societies such as the North Island Community Services and the CreativeNISS Society to explore ways to collaborate. Our Summer Camp will feature numerous guests such as foresters, biologists, artists, nurses, dietitians, yoga instructer, etc., to help provide an amazing experience of kids. We will also be working with the Vancouver Island Regional Library during the summer as part of our Summer Camp. We’ve talked to the A-Frame church about use of their community garden. We have numerous individuals who will be putting on workshops at our Makerspace. Beyond that, and going forward, we’d love to chat with any individual or group who would be interested in collaborating with us. How do you express appreciation to your members/supporters? First of all we offer discounts to our members to help reduce the financial burden as much as possible. We also try to be mindful of how reliant we are on community support – truly, what we offer will live and die depending upon if its something the community supports… so, we try to thank people as much as possible. We thank our volunteers on the facebook page we have set-up for them, we thank and highlight them in our newsletter as much as possible. For our large cash donors we have posted announcements on our facebook page, and have taken out newspaper ads to publicly thank them. In the case of our Play Centre we created a window decal to display the logos of our large corporate donors. We definitely try to give our thanks to supporters, but there is always room to do a better job of that. Are you happy with the group’s results/stats so far? We are happy as we feel we’ve come a long way in a relatively short amount of time. As we are talking about shifting culture and health outcomes, we will likely need to wait a few years before we start to get a good picture of the difference we are making. Even then it will be hard to know if outcomes are changing because what we are doing, or because of the cumulative affect of all the changes/interventions that are happening in our town. Having said that, what we do know is that we’ve had well over one thousand children visits to our Play Centre. We’ve had a senior who volunteers with us and has expressed that doing so makes her feel more connected to her community. We’ve had a mother tell us that she feels that because of the Play Centre, her older child is able to be a better big brother to his sister. We’ve had parents and children stay for 3-5 hours at a time at the Play Centre because it’s given them a place they feel they want to be. All of those results are really encouraging for us and help signal that we are on the right path. Do you issue tax deductible receipts to donors? Receipts are available upon request, however we are a registered non-profit society, but not a registered charity at this time. That may change in the future, but in the meantime we can not offer tax-deductive receipts to donors in the same way a charity could. The combination Toy Library & Makerspace is going to be an all-ages space where people’s imagination and creativity will be fostered. The Toy Library is a repository of toys – children will be able to borrow toys, take them home, play with them, and return them. We believe that this will end up saving families hundreds, and potentially thousands, of dollars over time and will level the playing field for kids of different socio-economic backgrounds. The Makerspace is a place to make things, invent, create, learn, and share. Makerspaces are relatively new, and most have a focus on exposing people to Science, Technology, Engineering, and Math (STEM). Ours will also incorporate the Arts (STEAM). We will have tools such as a 3D printer, robotics, computers, sewing machines, a serger, a silk-screen press, crafting tools, etc. We have lined up numerous locals who will be putting on workshops for how to learn/use these tools and skills. When workshops aren’t running, the space will be available to use the tools and their new found skills. Grants that are in the works? We have applied to a number of grants – some which are a bit of a longshot, and others we feel we have a fighting chance to get. How do you keep your members/supporters up to date? We have a facebook page which we update regularly, and have a monthly newsletter. The newsletter is posted to our Play Centre window so that it can be read from both the inside and outside, and it is posted to our facebook page (www.facebook.com/pmkidsinmotion). We are also developing a webpage which we hope to have up and running soon. Saturday night the hottest ticket in town was the 2nd Annual Rotary Spring Fling. 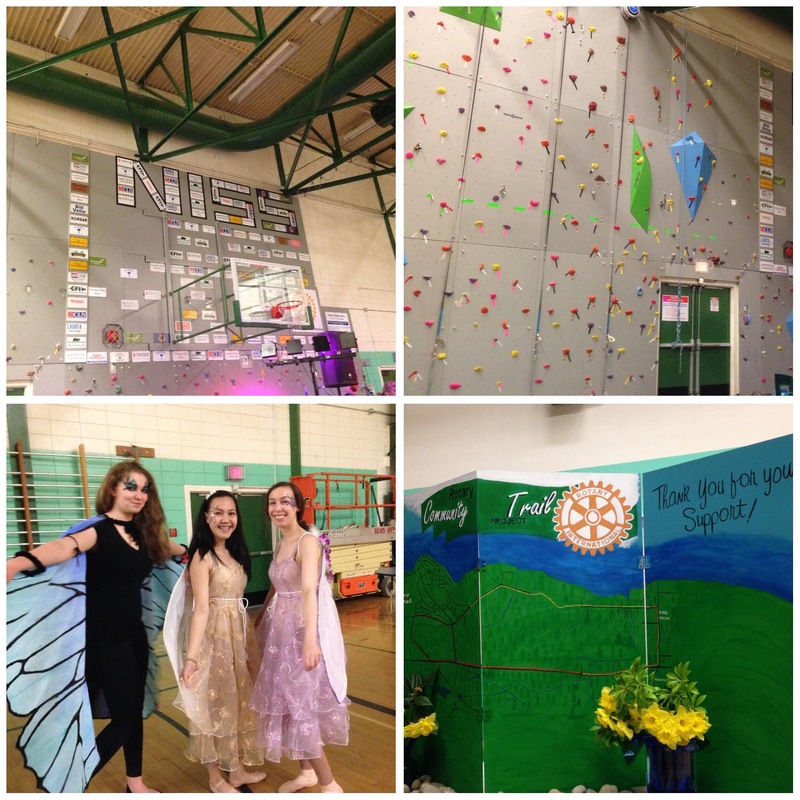 The Rotary Club of Port McNeill created the event last year to raise awareness and funds for an indoor climbing wall in the North Island Secondary School gym. For many of the 100+ people in attendance it was their first view of the completed wall. Interested climbers quickly signed a waiver, donned the proper gear and strategized their route of footholds to the top. Acoustics in a school gym are always a challenge but local band The Shifters was a crowd pleaser performing sing along, make you want to dance oldies but goodies. Well done !! to the 24 students involved in setting up the venue, meal prep and serving the meal. Some of them are Interact members which is a service club for young people ages 12 to 18, sponsored & supported by the Rotary Club. Interact fosters leadership, service to others and international understanding. And a shout out to all the cooks in the kitchen — dinner was absolutely delicious !! Big bowls of Greek and Caesar salad followed by a generous serving of lasagna. Garlic heaven !! For those that still had room (heck ya I did) there was an ice-cream sundae bar with choices of sorbet, ice-cream, sprinkles and sauce. After dinner the Masters of Ceremony Chris Stewart and Cheryl Jorgenson (who were an awesome tag team and no they didn’t pay me to say that) outlined the history of the climbing wall and the ongoing efforts. The main focus of the this year’s fundraising however is the Rotary Trail. Phase 1 of the trail leads from the intersection of Mine Road & Campbell Way to Hwy 19. Phase 2 continued the trail from the t-intersection heading north to the first logging road creating a huge loop. The vision is to extend the trail from the t-intersection of Hwy 19 & Campbell Way south to the airport. After the dinner plates were cleared away the live auction started. So here’s how it worked. Donated items displayed on the tables were all numbered. That number was placed in a helium balloon. Then the auctioneers would tell us which category the balloon was in — either $30 to $50 range or $50 & up range. The successful bidder would then be given the balloon to pop and find out what number item they’d won. Being a multi-generational event the first items were geared to the younger guests. When all the balloons were purchased the auction moved onto the bigger items in a real live auction. There was a signed Trevor Linden jersey, a trip to Nimmo Bay Resort, a helicopter ride with West Coast Helicopters and loads of gift certificates. When I asked Rotary President Deborah Murray yesterday how much money they’d raised she told me they don’t have a final tally yet but it was a very successful event. Coming up Saturday May 6th is the first Rugged & Wild Rotary Race a 10km run/walk/bike race. Entry is $10 and there will be entertainment at the start/finish line. The Farmer’s Market will also be set up onsite. Murray envisions the race morphing into something runners/walkers will add to their list of events. Next year there will be timers and participants will be given a number. Whether you’re selling homemade jam at the farmer’s market or the largest company in town — how a customer is treated can make or break a business. The Bargain Shop in Port McNeill strives to provide excellent customer service and it shows. April 1st will mark the ten year anniversary of The Bargain Shop opening and Michelle Monk was part of the original team. Originally as a “key holder” and one year later she was promoted to manager. I recently sat down with Monk to find out what makes The Bargain Shop tick. One of the biggest challenges, according to Monk, is competing with stores that offer online shopping. She notes, “we’re a a smaller company and we may get there but we’re not there yet. People from this town can get anything they want or need and easily order it from home, not having to leave their house or shop and look. Tough to compete with that and it’s getting bigger. I see comments on Facebook that someone has just received a big order for food and I can’t comment, but I’d like to say come and check out our prices.” Many items are the same price as stores down island and sometimes they may be priced a dollar or two higher but Monk stresses the importance of keeping business in town. When asked about attaining personal Monk explains, “some people have a knack for it and those are the ones I want to hire.” Staff are told “never to point” to an item but to personally take the customer and show them where the item is located. That’s also why there are no aisle numbers in the store. It gives the staff a few moments to chat with the customers and make them feel welcome. Monk asks her staff how they feel when they walk into a store without being acknowledged. She says “all it takes is a hello or a how are you and in a small town it is easier knowing so many people. Chamber of Commerce members followed the aroma of coffee for the most recent Member to Member meeting Wednesday April 15th at North Island Secondary School (NISS). The meeting was hosted by 1-11 Roasting, a student operated coffee roasting company. This innovative program started with a student looking for another block in Doug Abbot’s Learning Assistance classroom. Abbot explains, “I thought we could do more than that so I offered him an entrepreneurial studies block and he build the very first coffee roaster and started roasting coffee. He built a vacuum brewer and started brewing it and selling it to teachers twice a day.” Teachers being a great market for coffee and requests from people wanting to buy bags of coffee led to a successful fundraiser for the girl’s soccer team. The program got more popular, involving more students and it quickly became apparent to Abbot that it was bigger than one student and himself. According to Abbot the first roaster was a brilliant design but something more high quality and safer was required. A team of students and teachers sat down and started designing a new one (shown above). It took about three months and Abbot praises the design as “phenomenal.” Not pretty perhaps but the stainless steel drum inside an aluminum body is hooked up to a computer with thermometers & roaster all talking to each other. Add engineering, woodworking, computer science and electrical experience to an impressive list of skills students are learning. When students are working on big orders they set up stations in a classroom with students responsible for weighing, labeling, bagging and in charge of quality control of each bag of coffee. Art students designed the company logo and a booth at the Christmas Craft Fair in December gave students invaluable experience dealing with the public while selling more than 80 pounds of coffee. Kingfisher Wilderness Adventures and Strategic Natural Resource Consultants are two local companies using 1-11’s coffee. The Port McNeill & District Chamber of Commerce is a shining example of how great things can grow out of an egregious situation. In 2015 without warning or consultation the Town of Port McNeill made the unilateral decision to take back control of the Visitor Information Centre and stop funding the Chamber of Commerce (previously funded by 75% of business license money collected by the Town). Besides terminating that essential funding other repercussions were the loss of a full time employee that managed the Chamber & Visitor’s Info Centre as well as office space.